It took 19 games, but on Jan. 20 Marquette fans discovered why Buzz Williams and Brad Autry were so ecstatic to to get their hands on John Dawson. The 6-foot-2 point guard arrived at Marquette after choosing the Golden Eagles over Auburn, Colorado State, Creighton, UTEP and Wyoming. Despite his Clovis, New Mexico hometown, he considered schools all across the country before landing on Marquette. The infamous YouTube theory (or lack thereof) and lack of national recruiting ranking made us wonder about how Dawson would fare at the Division I level — it’s only fair that past players without such standing struggled (think Jamal Ferguson) — and being stuck behind leading minutes man Derrick Wilson did him no favors. 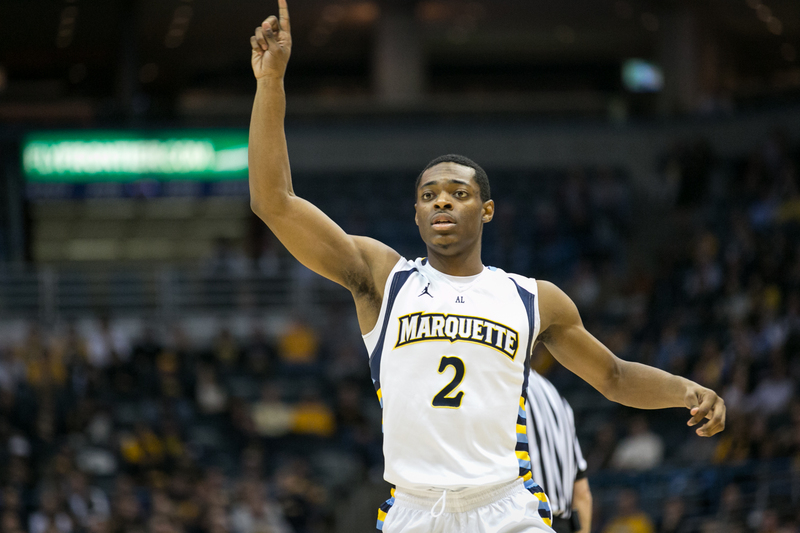 But with Marquette struggling midway through the second half and Wilson in a(nother) funk, Williams opted for his freshman to take the Golden Eagles home. And that he did. In the game’s final 14 minutes (overtime included) Dawson scored nine points, including seven in overtime, to secure a victory. He also added a pair of 3-pointers (one more than Derrick Wilson made all year) and looked the part in 31 hard-earned minutes. That stellar play vaulted into toe rotation on a more consistent basis, as he averaged 11.3 minutes the final 12 games of the season (though he did log two DNP’s). That stretch was up-and-down (6 points at Providence, 5 point at DePaul; 0-for-4 shooting in 18 minutes vs. Georgetown, two turnovers in 2 minutes vs. St. John’s) but overall he proved he can keep up at the Division I level which, for a freshman, is all one can ask for. The raw numbers won’t show all that much — 32 percent from the field, a 1.5 A/TO ratio, three steals in 245 minutes — but on a team that wasn’t going places in his freshman season the flashes were more important than the actual output. He held his own at Georgetown, handed out four assists at home against the Hoyas and earned Williams’ trust, something that’s important, Wilson’s struggles or not. Defensively, Dawson’s Defensive Rating was the worst on the team, though he was hurt by his lack of steals, which tends to underrate perimeter players. The 0.794 points per possession-allowed (third on the team behind Derrick Wilson and Jake Thomas) are more indicative of the kind of defender he was: a fairly good one. With solid length and a quick first step, he contributed to the Golden Eagles’ overall numbers. It should be noted he committed 6.4 fouls per 40 minutes, far too many but for a player who averaged 10 minutes it wasn’t too big a deal. That should bode well for his sophomore season, though it’s unknown whether he’ll get much of a shot. With the addition of BYU’s Matt Carlino and Wilson entrenched in the rotation, Dawson will have two seniors in front of him, not to mention Duane Wilson’s arrival in the lineup after he missed all of last season with a broken leg. There’s a spot for Dawson, though it may come next season. Still, Steve Wojciechowski’s offense needs outside shooters, and despite his 7-for-26 mark from outside he’s a player who’s going to contribute in that area. Another offseason of individual work, strength and conditioning and learning the Wojo offense will serve him well.